It’s starting to look like spring is on the way, well sort of. Even though its only 10 degrees now we’ve had several warm days and its supposed to be 60 here this Friday! For many homesteaders springtime means sugaring. We finally have enough land and enough trees to make syrup. It seems a little funny to have had to move out of New England, the self proclaimed land of maple products, to make syrup but we couldn’t be more pleased with our new land. Have I mentioned that we went from living on 1 acre to 60 acres? It’s going to make such a difference for so many of our homesteading goals. The land is hilly but its beautiful and it’s forested with some incredible species. Everybody’s favorite the sweet Sugar Maple, beautiful patchwork skinned Sycamores, and tall Black Walnuts. For those of you who may only be familiar with Maple syrup you can also make delicious syrup from the sap of Sycamores, Black Walnuts, Birches and many other trees. Sugar Maples are a favorite because they provide loads of sap with high sugar content – the syrup maker’s dream. The others may make a less syrup but they all have their own delicious flavors. I’ve personally had and loved Maple and Birch syrup but am excited to try Sycamore. I’ve been told it has a butterscotch flavor. This year we decided to tap Sugar Maples and Sycamores. We have a lot of mature trees on our hillsides but we decided to tap just 10 trees this year as we’re just getting settled in here. For people who have never done it making syrup can be an intimidating process but it really is quite easy, I promise. 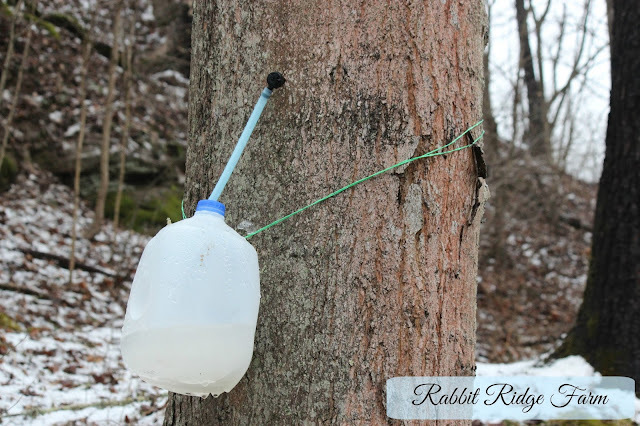 You don’t need big sap lines, an evaporator, or a sugar house. Really all you need is some basic and fairly cheap equipment and time. One of the biggest questions that we had about sugaring is when do I tap? This can be tricky as the weather is different every year and varies so much depending on where you live. There is never a set sugaring season. In fact I would say that the start date is even less dependable than that of spring planting. That being said it’s not that difficult to figure out either. All you need for the sap to be flowing is below freezing temperatures at night and above freezing temperatures during the day. Before placing taps we prepared our materials. We cleaned the jugs and drilled holes in the caps that fit the plastic tubing. We decided to use jugs because they were free and the cap kept insects out of our sap which can fall into normal buckets (which is not a big deal if you have buckets to use). We put all the spiles onto the tubing which was a bit difficult because it’s such a snug fit. To make it easier we heated the end of the tubing briefly with a lighter. To place our taps we used our 7/16 inch bit to drill in approximately 2 1/2 inches at a slight upward angle. We used masking tape to mark 2 1/2 inches on our drill bit. Then we placed our tap in our drill hole, hitting it gently with a hammer to make sure it was in securely. We hung our jugs around the trees using old bailing twine. After a few days we realized that the easiest way to hang our jugs so they were easy to empty each day was to put a screw in next to our tap and hang the jug on bailing twine from it. On days when the temperature has been right the maples especially have to be collected at least every evening. If you’re getting just small amounts at a time it’s feasible to just set a pot on your wood stove to boil the sap but it takes a long time so I don’t recommend using a regular stove for that long. If you have a lot of sap this is what we’ll be trying: a DIY evaporator from One Acre Farm. Once our syrup is boiled down we strain it through a coffee filter and store it in mason jars. Homestead Honey provides wisdom on making Black Walnut syrup on a backyard scale. One Acre Farm offers a plethora of information on everything maple syrup from identifying the trees to canning your syrup. 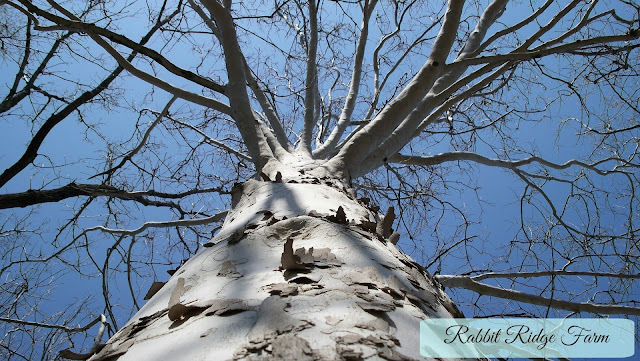 A Return to Simplicity provides a comprehensive guide to tapping trees. Lately I’ve realized that a huge part of homesteading is community, passing on wisdom and skills. I chose to include these three posts because they helped me and I hope that they’ll help you too. Please let us know how sugaring was/is in your area. We’d love to hear your stories! This post is linked to Our Simple Homestead Blog Hop, Simple Saturday’s Blog Hop, and the Front Porch Friday Blog Hop. 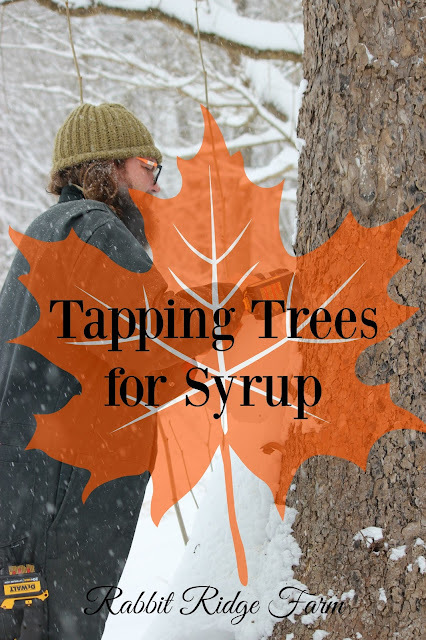 4 Responses to "Tapping Trees for Syrup"
Great info on sapping. My son, he's 11, wants to tap trees this year, so with all the online info we're collecting, I think we'll be able to handle tapping 2 trees to give it a try. I really like your idea of sharing other blogger's posts as a way to increase community. Way to go. That's great I helped others tap when I was a kid and it was a great experience. I'm sure he'll love it. Thanks I was really hoping people would like that! A friend of mine is trying this out for the first time this year and really enjoying the process. I have always been super curious about giving this a try! You should totally try it, especially on a small scale it's so fun and easy. Good luck!